ORLANDO, FL--(Marketwired - Apr 23, 2015) - Larry Rinker has been appointed Director of Instruction at The Ritz-Carlton Golf Club, Orlando, Grande Lakes. The Ritz-Carlton Golf Club is home to an 18-hole Greg Norman-designed championship golf course and is the annual host of the PNC Father/Son Challenge. Short Game Specialist Larry Rinker, is a 34-year veteran member of the PGA Tour and in this role will lead all resort guest and membership golf instruction, including group clinics, player development programs, multi-day golf schools, and special instructional programming all with V1 video analysis. "We are delighted to welcome Larry Rinker to The Ritz-Carlton Golf Club, Orlando, Grande Lakes," said Nathan Stith, Director of Golf. "His knowledge and talent combined with his exceptional experience will grow our program and further position The Ritz-Carlton Golf Club, Orlando, Grande Lakes as one of the country's leading golf destinations." A native of Stuart, Florida and a 30-year member of the PGA of America, Rinker is one of the most sought-after short-game coaches in the country. A Master Certified Trackman Golf Instructor, Rinker has written three instructional ebooks and is the host of a golf instruction show on SiriusXM PGA Tour Radio. Rinker first competed in major Florida state junior golf tournaments at the age of 12, and his competitive accomplishments include: Finishing in the Top 125 on the PGA Tour Money List 12 times with 525 PGA Tour starts and 283 career cuts (played in 15 Majors), 7 U.S. Open appearances, 3 British Open appearances, 3 PGA Championships appearances, 2 Masters appearances, and more. Golf is a family affair for Rinker -- his sister Laurie twice won on the LPGA Tour, and Larry and Laurie won the J.C. Penney Mixed Team Classic in 1985. Rinker's younger brother Lee played the PGA Tour for six years with two second-place finishes. Rinker holds a Bachelor of Science degree from the University of Florida. In addition to his role at The Ritz-Carlton Golf Club, Orlando, Grande Lakes, Rinker is the Director of Instruction at the Red Sky Golf Academy in Wolcott, Colorado near Vail each summer. Grande Lakes Orlando is a 500-acre resort with a luxury 582-room Ritz-Carlton and deluxe 1,000-room JW Marriott hotel situated at the headwaters of the Florida Everglades. Orlando's luxury leader provides an authentic, local experience from its farm-to-fork dining offerings to its Grande Lakes Adventures Experiences, which include kayaking, eco-tours on Shingle Creek, and a fishing school. Grande Lakes presents the culinary mastery of award-winning Chefs Norman Van Aken and Melissa Kelly's PRIMO, and the resort recently opened both on-site apiaries and an 18,000-square-foot Whisper Creek Farm, serving as a fruit & vegetable garden, chicken coop, and outdoor event space. In September 2014 the resort opened a new casual dining restaurant, Highball & Harvest at The Ritz-Carlton Orlando. Guests at both hotels can enjoy all the facilities and services at Grande Lakes Orlando, including the 18-hole championship golf course, designed by Greg Norman, the 40,000-square-foot Ritz-Carlton Spa with total-wellness treatments and a rooftop eco-space. The Ritz-Carlton and JW Marriott are connected by a robust conference center, with more than 150,000 square feet of meeting space, 6 ballrooms, 46 breakout rooms, and over 107,000 square feet of outdoor space. The estate is located 15 minutes from the Orlando International Airport, five minutes from the Orange County Convention Center and minutes from the major theme parks. 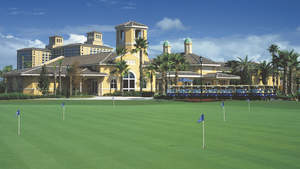 Membership offerings are also available through The Ritz-Carlton Orlando, Grande Lakes Members Club. For more information about Grande Lakes Orlando, visit www.grandelakes.com. Follow Grande Lakes Orlando on Twitter at @RC_Orlando and @JW_Orlando. The Ritz-Carlton Golf Club, Orlando, Grande Lakes appointed 34-year veteran member of the PGA Tour, Larry Rinker, as the new Director of Instruction.